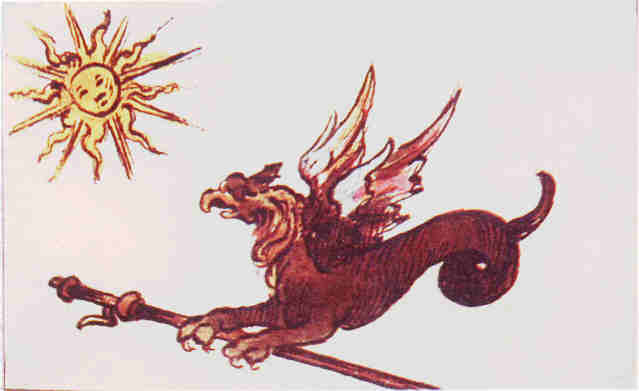 In this image : The Sun, Dragon, Beast, Sword, Animal with Angel wings. In this image : The Sun, a star, a sword, serpent, beast, red hair, two stalks of wheat and one stalk of wheat gone, 4 plants on the ground, snake, 7 fleur the lis, moon or sicle. 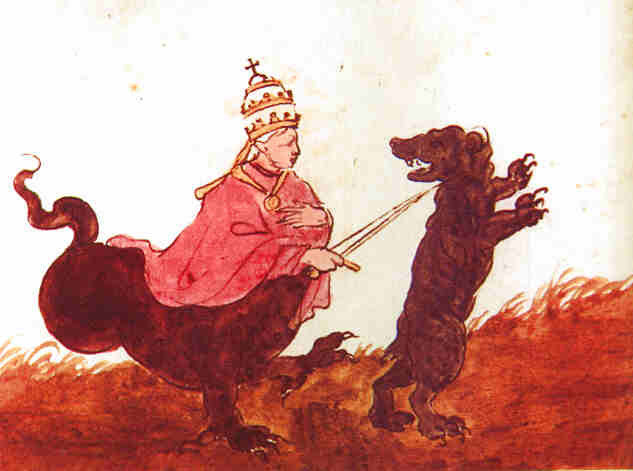 In this image : The Pope on the body of a beast, another beast, fighting, a sword. Daniel 7:24-25 The antichrist will be (a / or) man. Daniel 9:27 He will confirm a covenant for 7 years. Now also, this does not mean that he creates this covenant. The word here for “confirm” is 1396 gabar (gaw-bar’); a primitive root;to be strong; by implication, to prevail, act insolently: KJV– exceed, confirm, be great, be mighty, prevail, put to more [strength], strengthen,be stronger, be valiant. The antichrist will strengthen a covenant for a 7 year time span. Now this could be an existing covenant (like the Jerusalem Covenant) or a new covenant drawn up at that time. Daniel 7:8 He will rise among 10 kings. Daniel 2:44 This 10 nation Union (Daniel 7:8) will be a revived Holy Roman Empire. Daniel 7:8 He will uproot 3 kings from the original 10 kings to gain political power. Revelations 13:1-2 His 10 nation union will merge into a world government which he will dominate. Now this also, could refer to several things. First, the 10 nations could merge into an EXISTING world government, such as the U.N. Or it could for a new world government, much like the U.N. Or, this 10 nation confederation could be something like the new 10 nation common stock market. A union like this would definitely rule the world, without having a “seat” of power. Whoever controls the money, controls the globe. Daniel 8:25 He will ascend to power on a platform of peace. By peace, he will destroy many. Revelations 13:11-12 He will be promoted and exalted by a miracle working religious partner (False Prophet – A False Religion or False People within this Religion). Revelations 17:8 He was, and is not, and yet is. More than likely this is referring to political power. The antichrist will have ruled, but then be taken out of power. Only to rise back up again to power as the head of the One World Government. Revelations 17:14 The world government over which he rules will be a red (communistic or socialistic) government. Daniel 7:8 He will have a mouth speaking great things. Very boastful. Daniel 7:20 His look will be more stout than his fellows. The word “stout” means 7227 rab (rab); by contracted from 7231; abundant (in quantity, size, age, number, rank, quality): KJV– (in) abound (-undance, -ant, -antly), captain, elder, enough, exceedingly, full, great (-ly, man, one), increase, long (enough, [time]), (do, have) many (-ifold, things, a time), ([ship-]) master, mighty, more, (too, very) much, multiply (-tude), officer, often [-times], plenteous, populous, prince, process [of time], suffice (-lent). So this can have several meanings. It could mean one of the following: the antichrist will be larger in size than everybody else, will be older than everybody else, will have more of a “following” than anybody else, is a higher military or political rank than anybody else, or is more qualified than anybody else. What ever this verse is speaking about, it is obvious when you look at Him. Daniel 8:23 He will have a fierce countenance. Daniel 8:23 He will understand puzzling things. Daniel 8:25 He will cause craft to prosper. It is interesting to note the definition of the word “craft” here. It is 4820 mirmah (meer-maw’); from 7411 in the sense of deceiving; fraud: KJV– craft, deceit (-ful, -fully), false, feigned, guile, subtilly, treachery. No wonder, for the Bible says that he is the father of lies. So his policy or his success will make it possible for his deception of the world to prosper. God said that if you do not believe the truth, that he would send strong delusion that you should believe a lie. Revelations 13:5 He apparently assumes world dominating power 3 1/2 years after he confirms the covenant. He then will continue to reign for 42 months. Daniel 9:27 The Abomination of Desolation is the event that signals the beginning of this final 42 months. It is interesting to note, that many scholars believe that at the Abomination of Desolation is when Revelations 12:7-10 occurs. At which point the Antichrist becomes “possessed” by Satan himself and then forces the Mark or death upon everybody. Thessalonians 2:4 He opposes God. Daniel 11:36 He will speak marvelous things against the God of gods. Thessalonians 2:4 He will exalt himself above all that is called God. Thessalonians 2:4 He will sit in the temple of God. Thessalonians 2:4 He will claim to be God (or an incarnation of God). Daniel 11:31 He will take away the daily sacrifices from the temple. Daniel 11:45 He will plant the tabernacles of his palace between the seas in the glorious holy mountain. It would seem here that the Antichrist will setup small “fortifications” in between the sea and Jerusalem, to help keep control over things in distant areas away from the main offices. Revelations 13:7 He will have power to make war with the saints and to overcome them. Daniel 7:21-25 He will continue this war with the saints for 3 1/2 years. Matthew 24:15-21 This time of Great Tribulation is launched upon the Earth by the antichrist at the Abomination of Desolation. Up until this time, it would seem that he is a man of peace and not war. But now he shows his true colors. Perhaps is possessed by Satan himself at this point as well. Which would account for the false front being dropped at this time. Daniel 12:7 During this time, the antichrist will scatter the power of the holy people. Daniel 7:7 He will rule a mighty and strong kingdom. Revelations 13:7 He was given power over all kindreds, tongues and nations. Daniel 7:23 His kingdom will devour the whole earth. Daniel 11:31 He will have great military power that will stand behind him, to enforce his laws. Daniel 7:25 He will try to change times and laws; and they will be given into his power for 3 1/2 years. Daniel 8:24 He will prosper in everything that he does. Daniel 11:37 He will not regard the God of his fathers. Daniel 11:37 He will not regard the desire of women. It is interesting to note here that most people think that he will be a homosexual, which could be. But rather I think that he will place limitations upon children being born. Similar to what is being done in China now. Why? Because it is the natural desire of a woman, that God has given to them, to be a mother. By not regarding this natural desire, he would cause a “forced” limit on the amount of children a woman was “allowed” to have. Revelations 14:11 The mark of the beast will be the amount of his name. Revelations 15:2 All that dwell upon the Earth will worship him, except those who’s names are written in the Lamb’s Book of Life. Revelations 15:2 He will have an image made after him. This could also be in reference to his kingdom’s logo or insignia. Much like the U.N. has a logo that every soldier on a U.N. mission must wear, there might also be a logo or insignia that his armies would have to wear His coming will be after the workings of Satan. Thessalonians 2:8 His coming will be after the workings of Satan. Revelations 17:14 He will fight against Jesus Christ at Armageddon. And he will loose. Daniel 8:25 He will stand against the Prince of princes. Thessalonians 2:8 The Lord will consume him with the spirit of his mouth. Which is the Word of God. Thessalonians 2:8 The Lord will destroy him with the brightness of his coming. Which is his glory. Revelations 19:20 He will be cast alive into the lake of fire. Revelations 20:10 He will be tormented day and night for ever and ever. When the Antichrist arrives, the endtime begins !